Ashley Dickey & John Johnson. 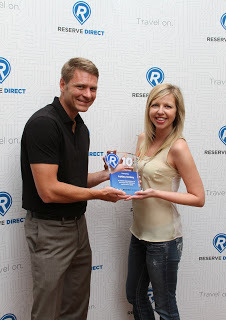 As travel company Reserve Direct celebrates 13-years of providing travel reservations for customers and booking solutions for travel suppliers, it is also celebrating another milestone— it’s first 10-year employee. Ashley Dickey, Reserve Direct’s Destination Content Manager, started with the company in 2003 and, besides the three owners of the company, has been the longest running employee to be part of the growth of the company over the bulk of its history. Ashley was promoted to Destination Specialist, where she began generating content for all of the Reserve Direct destination Travel Guides, focusing on news, events, and travel tips. After completing a B.A. in English with an emphasis on Literature and Mass Media at Missouri State University, Ashley was promoted to Destination Content Manager, the position she currently holds. This new job gave her greater control over the content generated on all of Reserve Direct’s websites. Ashley has been instrumental in leading content creation for products, blogs as well as social media and product reviews. Reserve Direct congratulates Ashley on 10 years of dedicated service. Reserve Direct is a travel reservation technology company that focuses on specific travel destinations, offering local expertise and reservations for shows and attractions, as well as hotel reservations to vacationers, families and businesses. The company also offers fulfillment tools to travel suppliers and other regional travel resources. Reserve Direct provides travel service in a variety of markets like Branson, Missouri; Pigeon Forge and Gatlinburg, Tennessee; Orlando, Florida; Williamsburg, Virginia; the Hawaiian Islands; and Myrtle Beach, South Carolina.